My swap packages have been received, so I can finally post about them! I thought I'd start with the Buy Nothing/Green Swap I joined in an effort to de-stash. One of my partner's themes was toadstools, so I made her a toadstool pincushion! Here it is hanging out in my craft corner... I almost didn't want to send it off! :-) But my partner seemed to like it, so I'm glad I did! 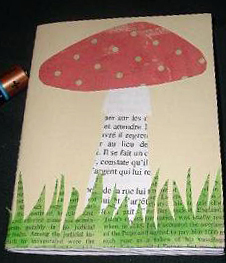 Continuing on the toadstool theme, I also made a little mixed paper notebook. I assembled the pages and sewed them together on my sewing machine, and it worked beautifully! Don't you just love toadstools? 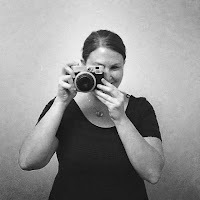 Kikar in......fin blogg du har. Tittar gärna in igen! Very nice to know your blog. This avatar must be you. You look like a princess in real life, too! Vilken fin flugsvamp och blogg du har :o). Tack för kommentaren på min blogg. I love it. It is beautifully made. Ahhh What a sweet gift well done my friend just gorgeous! Lovely toadstool I can see why you didn't want to send it off. Lovely toadstools! Both the felt and the paper. I love them! Hope you're having a nice Easter!